As a blogger you must share things daily with your readers to succeed in blogging, so as a part time blogger (Generally part time bloggers are student or may be working in a firm) they don't have enough time to write a blog post daily because of other works, because to write a blog post you must have at least 4 hours. Because an effective blog post must have at least about 1000 words to get benefits from this and also including end tag means conclusion of the article at the end of the article. That's why I am going to share with you my tips those I used to make my blog post daily at least once, but to maintain high quality I decrease my frequency to about 5 blog posts per week, because my blog posts always have about 2000 words so it takes time to write and proof read it before publishing it. In any work, planning is important, as a blogger you must do planning to write your blog post, to make it possible to write a blog post daily with a busy schedule, as I do write my next 7 days blog posts for my blog on my copy, to make it easy for me to create a post and also I do write few more thing like headings, subheadings, main points of the article, because you must have these things on your blog post to make it more attractive for users, okay that is fine for you, but what if you are newbie or may be you can not think about writing such lengthy article. Let me share with you, actually I am belonging from East India and it was 2013 when I was moving from East India to north India and I got lot of time in a train to write and I just open my bag to take my copy and I have started writing list of articles I am going to cover in next five weeks and that was awesome idea I got in that time and from that incident I always try to write list of blog posts while doing journey. I mean imagine writing list of blog posts and taking hot TEA it was an amazing experience I got, currently I am thinking about going outside for a long trip that's why I will get lot of time to write strategies planning for my next up coming project. Well, for the best idea I have written an amazing blog post for you guys must read and grab all my ideas to write blog posts on your blog. Use Keyword Research and Google trends, in fact use Google Important tools for know closer about your readers. Now all lists of blog posts you are going to cover in your blog by the end of month and remember, always set small targets and try to achieve it before time, that is the key to get success in business. As a blogger you must have some planning for the next day for your blog, so write about your planning for your blog on the copy or white board, I think best way is white board. This tips I have learnt from my director, well couple of things I have learnt from my direct while studying engineering, here is the list of things I have learnt from Director Sir. Planning must be written on paper always work most of the time what we think that our planning fitted in our mind but that is not going to work because this is my personal experience, so what is the conclusion of it that is always write planning on paper. Just before leaving your chair write what next for tomorrow. Use different colours pen for writing next day planning will create interest. This is really important and most of the bloggers don't do it, that's why they do not succeed in blogging, here is the reason because internet users having options to read many articles right, so every users want to utilize their time, then you have to write best content about the article, if you want to get trust of the users just like Wikipedia, so don't assume that you know the best, but you can come to know about the topic about best, if you will read other blogs those write about the same topics as you write. I was in a wrong direction when I have started blogging, I have my own idea and own strategies to write blog posts and promote it, yes I got good in that I was able to drove about 2.5 million page views to my first blog. But, just after three years I had to move to this blog, because I did not learn a lot from that blog because I did not read niche blogs and now a days I always love to read few blogs like QuickSprout, Johnchow.com and other few blogs, including a blog by Harsh Agrawal and of course founder of ShoutMeLoud, that's really a good blog. Find out why those blogs are top five- Let me tell you reasons they are professional, they are doing it full time, they most of the time out source people to things done, they are having interest to write and promote it. Try to use tools used by them if it is affordable for you. 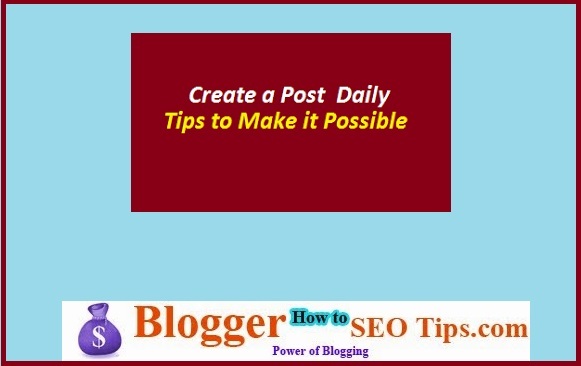 This is trending in bogging to get more traffic and guest post on popular blogs, of course this is a working method, you can also do the same but for getting guest post you have to have very good visitors and also well known blog for some topics. That's why people will write for your blog. Great content always attract traffic and more traffic means more people will come to know about your blog and more offer you are going to get from industry leader for guest post. Put contact form with mentioning- title of the blog posts, content of the blog posts, image SEO optimized that's why it will be easier for people to send you guest post. The reason is simple, I want this blog to be full of my thoughts about blogging, but soon I am going to open door for guest bloggers but only for quality guest bloggers. I think as a blogger you must write sometimes off of your blog topics which is good, but in the proper manner because writing any thing in a blog in well manner is not bad at all, because there are many peoples searching on the every seconds. So definitely people will come to your blog through that particular topic but you have to provide great information even for that particular topic. Though; I am not a great fan of this but sometimes you can write about off topics to get more people to read your blog because everybody having interest in every niche someone having more interest in some niche and someone not, but still all type of things we required so, this is one of the amazing way to increase your blog readers reach. Many times we don't have topic to write about on our blog that's why you can read popular blogs to know what people are thinking about on a particular niche topics, guide for creating best niche blog for Adsense. I personally used this tool everyday, yes my dear you have read it right everyday. If you are a student then you can easily ask your batch mate to write for your blog, I know anyone will love to do it, to make it useful for him or her, but you have to provide the identity of the person to encourage him or her to write for your blog and same you can apply for your colleague. Difficult, but few friends are good they always help their friends, may be few will ask you for money then its okay just pay them and but always check quality before going to publish it on your blog, few things to check before going to tell friends or colleague, if your blog language is English then your friend must be sound in English. Eager to write and always give some gift if you are not paying it will help them to put interest while writing. First of all just copy the above url and paste it on your browser and load the Google alert page. Then you will see a search bar, there type for what you wanted to get alert from Google, just like for me I have subscribed SEO Tips, Blogger Tips something like that staff, so you need to type according to your choice, lets assume you wanted to get alert for Cricket T20 World Cup, then just type there the same term. And then you will see option that is Create Alert, just click there and you are done. Now each time Google will find anything new about that topic you will be notified by Google to you by mail. You can also select few things on the options but at least after doing all these steps, you will become familiar with this. But, always track blog posts, I mean whether they are providing original content or not, because original content is most important for getting rank on search engines, therefore people are also going to like your content, there are many bloggers including me, hire writers to write blog posts, actually only in this blog I write almost all blog posts because this is all about blogging on others blogs I hire part time writers for writing and that is a great way for me. Why I am hiring writers? In online marketing world you have to invest money in many things, later I will write an article on this topic but today I am telling you investing money to get content is really worth it, I mean you are going to get super ROI (Return of Investment) but always buy high quality content. What are necessary things your blog post must have- headings, subheadings, bullets and of course numbers these are really needed and before going to publish the article you need to proof read it. Is there anything else help you to write blog posts daily? I am looking for home based online article writing job. I am expert to write content about government job notification and product description. So, Do you have any job for me ? How are you? nice to see you again on my blog.